“New Year, New You” the advertisers tell us. It’s time to do a detox. The magazines are full of it from both those who believe we should do it and those who believe it is all a commercial myth. So let’s leave the twenty-first century for a minute and imagine what was going on in our foraging past – in our wild state. Those of us who were going to survive the winter would have worked hard in the autumn. We collected lots of nuts – Scottish Neolithic archaeological sites turn up mounds of hazel nut shells – and probably some primitive grass grains to store up and help us through the winter. During the winter we’d have found shelter – possibly in caves but more probably in primitive shelters created in the forests among the warmth of the trees. We’d have hunted deer, rabbits and other non-hibernating animals and dug up roots such as dandelion, wild burdock, wild carrot, etc. when the ground wasn’t frozen. 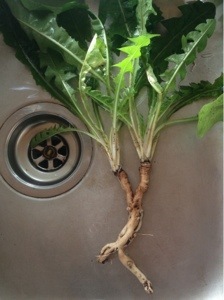 The dandelion roots shown on the left are delicious roasted and I often add them to a dish of roast parsnips or carrots. From what was available, our winter diet would have been primarily protein, fats and carbohydrates. In January we wouldn’t have been eating fruit as by now all the bilberries, blackberries, rosehips would have been eaten by us and the birds. So none of our calories would have come from sugar, even fructose (fruit sugar). If we were very lucky, we might find some late berries, such as these vivid orange sea buckthorn berries which can often still be found after Christmas, but they are sharp and sour although bursting with vitamin C with an antioxidant profile not far off acai berry! We would have found very small amounts of greens, small patches of bittercress, wintercress, wood sorrel, dandelion leaves and maybe some chickweed in a sheltered spot. But nothing in abundance. (Interestingly, the cresses are also very high in vitamin C that prevents scurvy.) During the winter the oceans are stormy so it’s hard to catch fish although the seaweeds are starting to make an appearance as their Spring is earlier than the land plants. We wouldn’t have gone far from our shelters as this used up calories, a dangerous game unless you were sure of a meal at the end of the trip. So we would probably have spent a lot of time in the shelters, cuddled up, restricting the amount of calories we burned off. So January and February are the hungry gap. When we would naturally have had a calorie restricted diet. This would not necessarily been every day but through intermittant fasting similar to the alternate day fasting protocols of today. If an animal was killed we would have feasted for a few days and used every part of it (like these rabbit skin mittens I made). If the ground thawed during a warm spell we’d have dug up roots and feasted. But these occasions would have been followed by days, or weeks of very little. Medical research nowadays shows that intermittant fasting is actually good for us. It helps to protect our cells against age-related diseases, improves heart health in the same way as aerobic exercise does, improves brain health (the brain is the only organ that doesn’t shrink in size during prolonged fasting as we need our wits about us). So this January and February, if you want to control your weight and your health, reduce the calories you eat with some alternate day fasting but don’t completely starve yourself of fats and carbohydrates on the days that you do eat, at this time of the year. Come Spring the plants burst into leaf again, and when you forage you’ll notice that you naturally enter a Spring Detox phase. All the new growth: cleavers, dandelion, thistle stems, nettle, etc., are either diuretic, mildly laxative or lymphatic cleansers. Nature’s new growth stimulates the digestive system and awaken our bodies as we change our diets away from winter fare and stop eating carbohydrates. What sensible forager would dig up a root when it was providing fresh salad vegetables? Join me on a foraging walk in the Spring to reboot after the winter and discover a world packed full of amazing tastes and natural health. Next PostGo Absolutely Wild this Burn’s Night!